Keep the dream alive and honor one of the greatest artists of all time with the full color, Michael Jackson lithograph set. Michael wanted to change the world, one person one song at a time. For many of us, he actually did. Now you can remember the King of Pop with two of his most famous and endearing photos. This set include a special edition print of Michael’s global phenomenon Thriller cover and a must-have collectible memoriam print. This limited edition lithograph is a must have for any Michael Jackson fan. 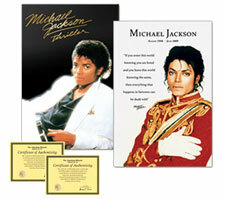 It is the only Michael Jackson collectible that has been authorized by the American Historic Society (AHS). Each piece contains the AHS insignia and comes with an individually numbered certificates of authenticity. With this available special offer, you can get both Michael Jackson lithographs for only $10 plus the cost of shipping and handling. 7 Comments on "Michael Jackson Lithograph"
I am rather offended by your commercial saying wearing a white suit as pure as his heart. Where was his pure heart when he was accused of child molestion, and then all of a sudden the case is dismissed with known money being changed hands between the parties involved. I think the commercial should be rewritten. I ORDERED MINE THE FIRST DAY THEY STARTED TO SELL! I CANT WAIT FOR THEM TO COME IN! i love michael! Robert, you obviously didn’t do your homework or you would know MJ is not a child molester. It is a total case of extortion. The media will say anything for higher ratings. I have been waiting on mine but have yet to receive my pictures, according to my bank statement, it doesn’t look like they took the money out, Are they still available? I LOVE THIS TRIBUTE OF THE MJ LITHOGRAPH HE IS THE KING OF POP & ALWAYS WILL BE HE WILL NEVER DIE!!! !